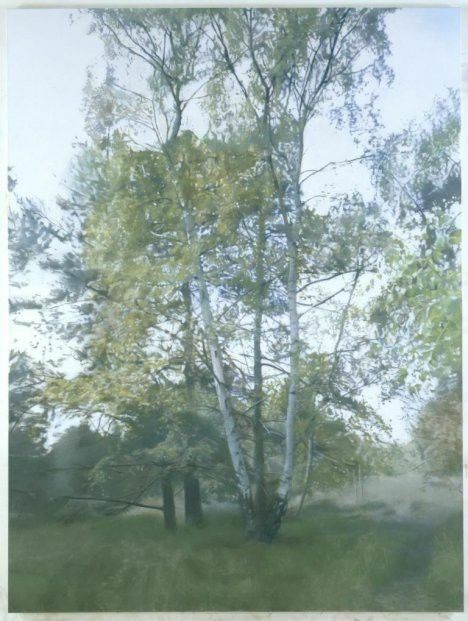 Birch 1, 2004. Oil on linen, 220 x 165 cm. Paintings by British artist Paul Winstanley, never before exhibited in the UK, will be shown (together with prints by the artist) in an exhibition at the Alan Cristea Gallery, London, to coincide with the launch of the artist’s new monograph, 59 Paintings. 59 Paintings, written by Winstanley, presents an artist’s personal view of how paintings are conceived, made and interpreted. He is known for his detailed, realistic paintings of often overlooked, vacant, but familiar landscapes and interiors, which are rendered in a muted palette. The exhibition will include several paintings from the monograph that come directly from the artist’s personal collection. Winstanley, who trained at the Slade School of Fine Art in the 1970s, and now lives and works in London, depicts scenes that include a woman peering out of a veiled window in Fitzrovia, a commuter asleep on the London underground’s Circle Line, a narrow ribbon of park between office blocks in Canary Wharf, and the interior of a decommissioned government building. These works are based on the artist’s own photographs. The exhibition also includes several print series’. Veil 1-8, 2008, a set of etchings which takes as its subject the motif of the veil, presents views a of net curtain hanging in front of a window, partially revealing a wooded landscape behind. Art School I-VIII, 2016, made from a combination of wood block and photogravure, depict the interiors of British art schools. The imagery used was selected from over 200 photographs taken by Winstanley when he travelled throughout England, Scotland and Wales photo-graphing unpopulated art school studios, including the Slade School of Fine Art and Goldsmiths, London, during their summer closures.